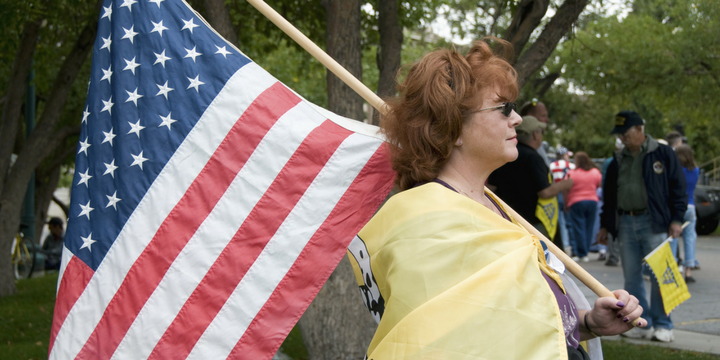 The tea party movement began nine years ago, and how things have changed! One of the biggest changes is that the mainstream media and left-wing activists once again consider dissent to be patriotic. For eight years, criticizing our government with facts, numbers, philosophical arguments, and reasonable disagreement was labeled as racist, uneducated, bigoted, treasonous, and hateful. Back in 2009, a group of Americans from around the country began working together to “resist” the breakneck speed at which progressive activists inside and outside the White House were implementing their agenda. The bailouts (which began in 2008) and the wasteful stimulus are both examples of policies that first inspired us to take action. Then came the battle against government-run healthcare – a battle we won in the hearts and minds of the American people in spite of losing legislatively. I will never forget the intense harassment members of the tea party movement received, and still do today, though it was especially extreme in the beginning. And it was all for high crime of disagreeing with the President on policy. Weird, right? It is certainly a noble cause to disagree now. Maybe the problem was that the tea party movement chose eagles, the American flag, and the Constitution as our symbols instead of hip, upraised fists. Maybe instead of wearing baseball caps and sun hats, we should have worn pink “kitty” hats or black bandanas around our faces. Maybe instead of cleaning up after our permitted rallies, we should have thrown Molotov cocktails, smashed windows and set cars on fire. As Americans, we are taught that we should be engaged civically and that we should stand up and fight if we see injustice. This is what we were doing when we attended congressional townhalls and marched on Washington, D.C. Funnily though, we were mocked, threatened, ostracized, and dismissed. Turns out when the Democrat party and their activist allies – including the media – encourage us to get involved, they really mean that we should get involved if we agree with them, if we are hard left progressives. Lucky for the left, progressive activists have hijacked our education system through the civics curriculum. The National Association of Scholars (NAS) is an organization that I started working within January of this year, and one of the most troubling reports NAS released was on this very topic. Even if you only read the executive summary you will see how civics education has been twisted to support progressive activism, and make no mistake, their goal is to infect all subjects with this new take on civics. You won’t have to look far to see how this indoctrination works in the real world. The student walkouts being organized in support of gun control, to strip innocent people of their Constitutional and natural right to self-defense are a perfect example. Hard left activist groups are using traumatized kids as weapons in a battle these groups have fought for decades, and the kids are perfectly willing to be used because they have been indoctrinated into believing that this is their purpose. Tea Party Patriots was born out of a desire to see the foundations of liberty restored and preserved for future generations so that every American has the opportunity to live in a free society. To this day there are millions of people volunteering locally, at the state level, and nationally to protect liberty for everyone. And unlike the students protesting for more gun control, we had to fight for every cent we raised, for every op-ed we published, and for every interview we booked. We had to fight to be heard, and we did. The people that support bigger and bigger government were scared of us because we represented, and still do, the great middle of America. The left claims to love diversity, but hated that we were, and still are, diverse. We don’t represent just one socioeconomic status, one gender, one race, or one educational background. Journalists with integrity that took us seriously reported – with surprise – that we were normal, everyday Americans that loved our country and our fellow Americans. The tea party movement’s founding was humble in a way, especially when compared to the 24/7-love fest that is any left wing protest movement (see: Occupy Wall Street, Coffee Party, Women’s March, etc. ), but we didn’t need fame and glory. We may not have the support of the media, or Hollywood, or academia, or Oprah, but we are strong, tenacious, and committed to making sure our nation’s kids will live as free people. Keli Carender was involved in the tea party movement and Tea Party Patriots from the very beginning, and is now the director of communications for the National Association of Scholars.